Pepsi is giving away millions each month to fund refreshing ideas that change the world. The ideas with the most votes will receive grants, so vote for your favorites. Do you have an idea that needs support? Learn how Pepsi can help. 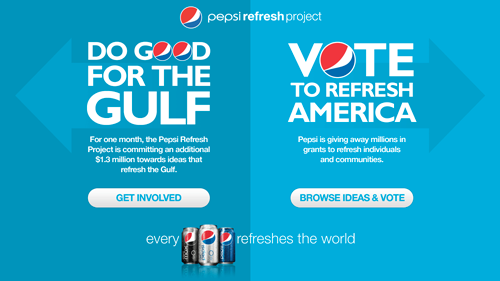 And right now, Pepsi is “Doing good for the Gulf” by committing an “additional $1.3 million” towards ideas that refresh the Gulf. Don’t get me wrong, this is all good stuff. Pepsi makes billions and they should be a good corporate citizen and give something back. I’m all for that. But then I wonder to myself… If Pepsi is making billions selling sugar water to people, does it seem like things are out of whack? I have two friends who are teachers that just got laid off. Those are just two people I know, out of the many layoffs that are happening in schools around my own state. It seems pretty sad that education gets cut while executives at Pepsi, a company that sells sugar water, are making excessive salaries. I could say that people like Pepsi better than education, but I’m getting pretty close to crackpot territory. I mean, I pretty much quit all soda drinking many years ago in favor of water, which, you know, is better for you, and cheaper, and… also probably sold in many places by Pepsi. I also work with a guy who loves drinking soda and he says it makes him happy, so who am I to mess with someone’s happiness? If you buy Pepsi products, all this “do-goodery” might make you feel good… but I wonder, would you feel better if you quit drinking soda, started drinking water, and donated all the money you’d save directly to the causes you care about? What if one million people did that? Take Pepsi out of the loop, take their cut out of the loop, and donate directly to the causes that need it, without a corporate middle-man taking a slice of the pie. Maybe someone at Pepsi got really bothered by this, and decided they could change the world. Or, maybe it’s more likely a lesson someone told me long ago… If you really want to change the world, start a business, and make lots of money. I’m not sure that was always the path towards changing the world, but it seems like nowadays, it’s the easiest path.